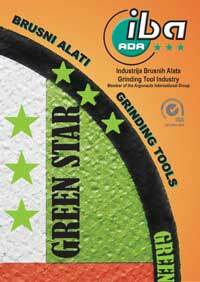 We are specialist manufacturers of cutting and grinding tools based in the town of Ada in northern Serbia. Our production program includes a very broad range of cutting discs, grinding discs and tolls, cup wheels and specialty products in all standard and custom-made shapes and sizes for metal, stone, glass and plastic finishing. These are used in industrial and at-home applications for both commercial and retail customers. We are able to offer complete packages of custom-manufacturerd tools from a range of 1000’s of proprietary designs. We recognise that every application has unique performance criteria, size requirements and individual customer specifications so our engineering, sales and manufacturing teams cooperate to produce reliable, high-quality tools that are entirely consistent with your needs. We specialise in being able to manufacture shorter-run quantities than some competitors but are happy to quote on all requirements. Pored masovne proizvodnje standardnih i namenskih proizvoda, jedna od naših specijalnosti je i pravljenje manjih serija. We are part of Argonauts Group and our shares are quoted on the Belgrade Stock Exchange.